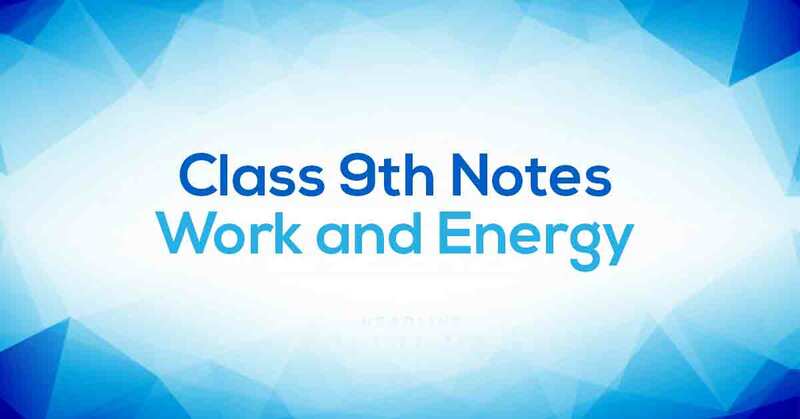 Work and Energy Class 9 Notes aims at increasing your self-confidence and reducing the pressure by offering a simple way to study or revise the chapter. These notes are prepared by our panel of highly qualified teachers, out of the past 10 years question papers so that the students don’t miss out on any of the important topics. Work and Energy Class 9 Notes would fuel your exam preparation which ultimately lead you to score maximum marks. Work done on an object is defined as the magnitude of the force multiplied by the distance moved by the object in the direction of the applied force. Work done = force × distance = F × s, 1 Joule = 1 Newton × 1 metre. The unit of work is joule. The energy of a body is its capacity of doing work. The S. I. unit of energy is Joule (1 KJ = 1000 J). Form of energy: (P.E & K.E. ), heat energy, light energy, sound energy etc. Kinetic energy is the energy possessed by a moving body by virtue of its motion. Learn More about the same in Work and Energy Class 9 Notes PDF.